This aquatint was made from plate 6 of 'Views in the Burman Empire' by Captain James Kershaw. He wrote: "This ascent to the Shoe Shando Prah, or Great Pagoda, is in the principal road from the town towards the country, and during the heavy rains was converted into a temporary barrack for European soldiers." 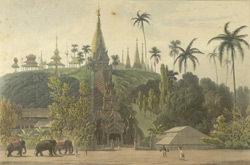 Having taken Rangoon, the troops under General Campbell marched north into Pye, the ancient town known to the British as Prome. Its name derives from the people known as Pyu who created city-states in Burma in the first millennium. Shwesandaw Pagoda is the town's most famous site, the name means Golden Hair Relic and it is believed to contain a couple of hairs of the Buddha. A little taller than the Shwedagon in Rangoon, this stupa is impressive on its hilltop setting.